If you lived nearby and wanted to come over to our home for a visit, I’d ask you to please give me a 24 hour warning. Why? I’m a terrible housekeeper. I fully admit it. 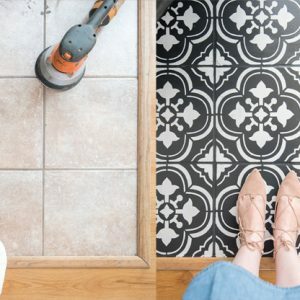 Our house is always in disarray, and I usually only clean it thoroughly when we’re expecting company or when I’m planning a photo shoot for the blog. As much as I love the look of a spotless home, I find that it’s virtually impossible to keep our house clean at all times with three little girls running around and both of us parents managing our own businesses. I think that’s one of the tricks to staying sane when trying to work at home – you have to let some things slide. For me it’s housework, and I’ve come up with a few shortcuts to make our rooms look pretty at a moment’s notice. 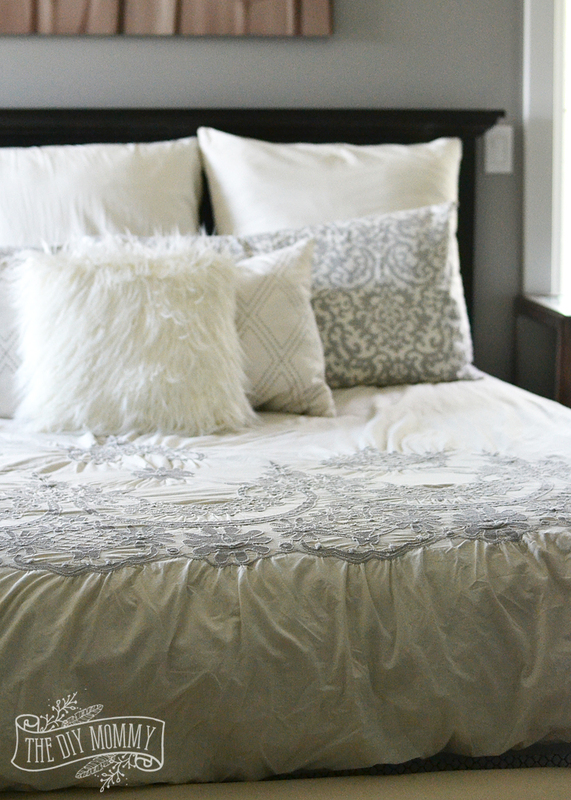 Here’s one of my favourites: how to make a bed when you’re a “lazy” housekeeper like me. This method is quick, easy, and it looks great every time! Let me first share with you our glorious new mattress set. Sean and I were married in 2006 – ten years ago. It’s truly hard to believe that it’s already been so long. Three kids, and a roller coaster ride of a decade later (mostly uphill climbs, but of course we’ve had our valleys), we were ready for a new mattress for our bed. We’ve had our old mattress ever since we first got married. After 10 years, this mattress was lumpy and tired. 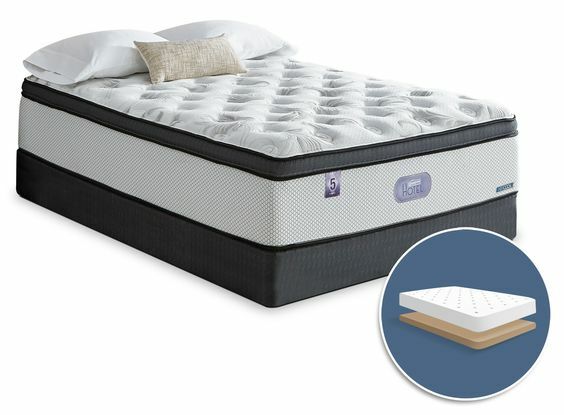 The older I get, the more I realize how important it is to invest in a good-quality mattress that’s soft on the joints and promotes a good sleep. Our old mattress just wasn’t cutting it, and I was finding myself waking up really tired and sore (oh, those 3rd baby hips)! 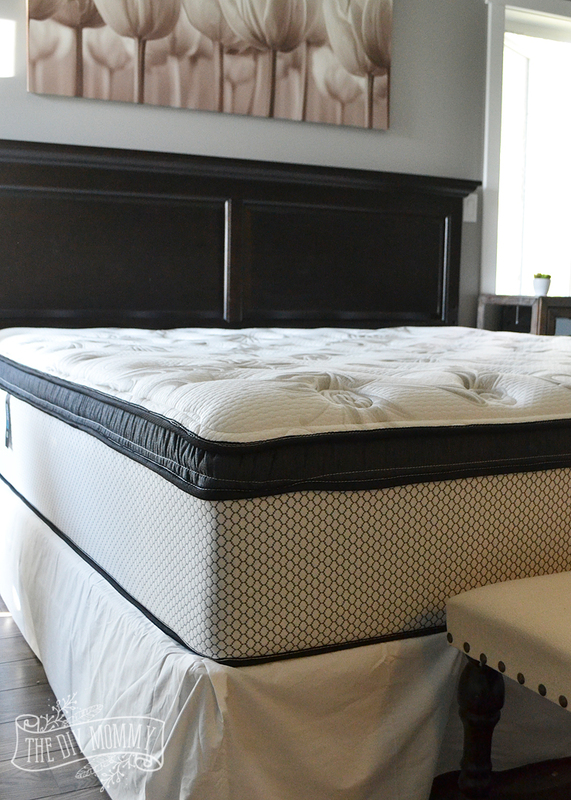 I was so excited to partner up with The Brick this summer to test one of their new mattress sets: the Simmons Beautyrest® Hotel Diamond 5.0 Comfort Top Firm Low-Profile King Mattress Set. When we first unwrapped the mattress, I was surprised with how cushy and plush the pillow top looked and I couldn’t wait to give it a test sleep! Here’s what happened. We set up the low-profile box springs, and put the new mattress on top. The hubby hopped on to give it a test run, and 5 minutes later he was asleep! 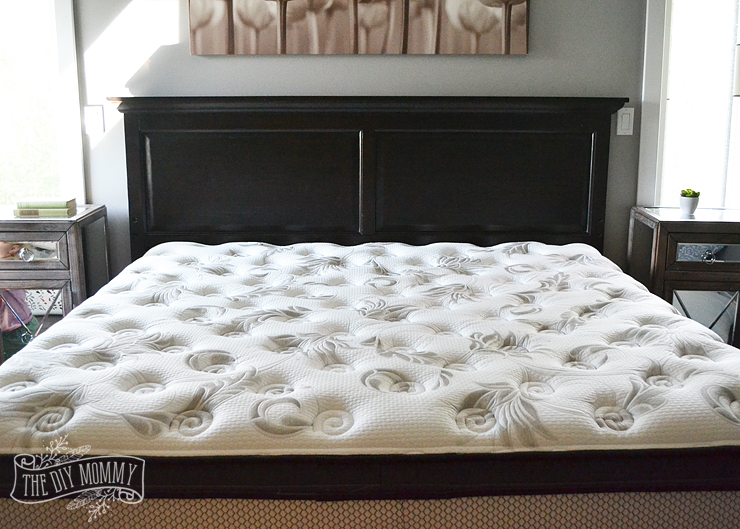 The comfort foam on top of this mattress is seriously dreamy, and your body feels cradled and supported while you sleep. Obviously Sean loved it. And so did I. I was hooked after night #1, and it didn’t take my body any time to adjust to this new mattress. I found that the Ergo Comfort Layer helped with my sore hips and upper back, and I’m having such great sleeps! 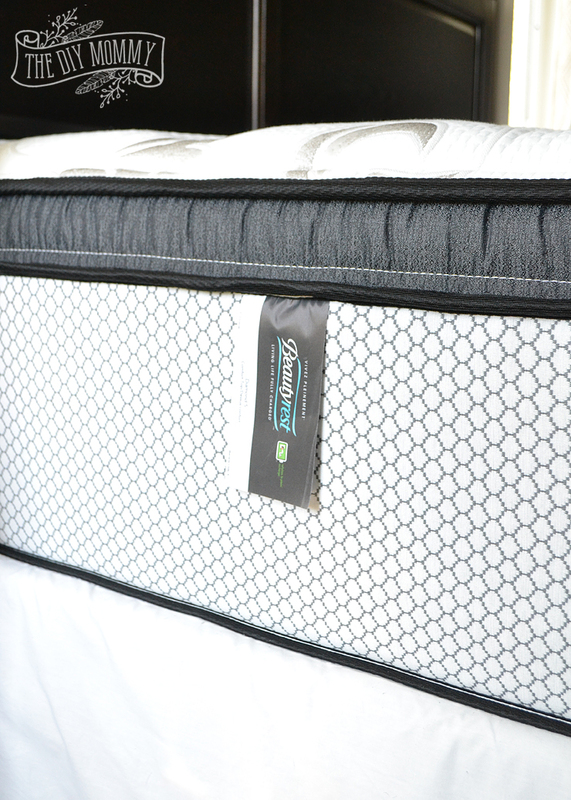 You can find this Simmons Beautyrest® Hotel Diamond 5.0 Comfort Top Firm Low-Profile King Mattress Set here at The Brick and it’s currently on sale! Now, let me show you how I lazily make our bed. Ours is a King sized, so I’ll share the adjustments if you have a Queen mattress. First, start with a fitted sheet. 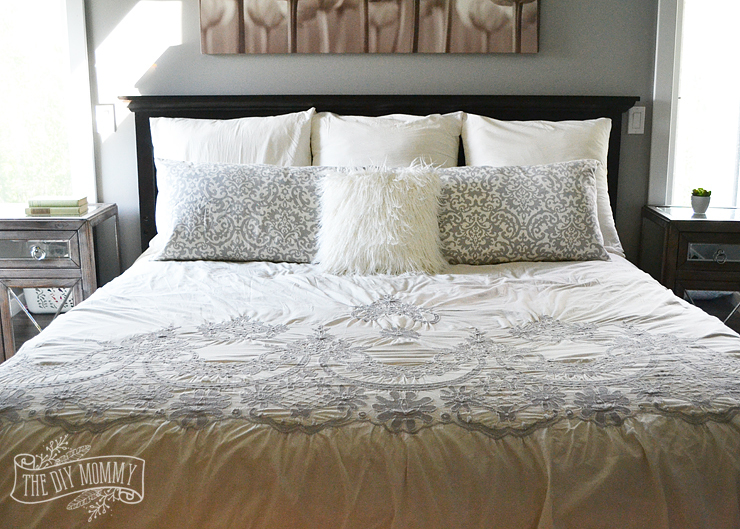 Next, cover a duvet with a pretty duvet cover using the duvet rolling hack I shared on Tuesday. Then, rest three euro sized pillows in plain covers on the headboard. (Use 2 if you have a Queen bed). Two King sized pillows for sleeping are layered in front of the euro pillows. (Use regular pillows for a Queen bed). Finally, one decorative pillow is placed in the front center. This one’s just for show, so you can have some fun with faux fur or an interesting texture. 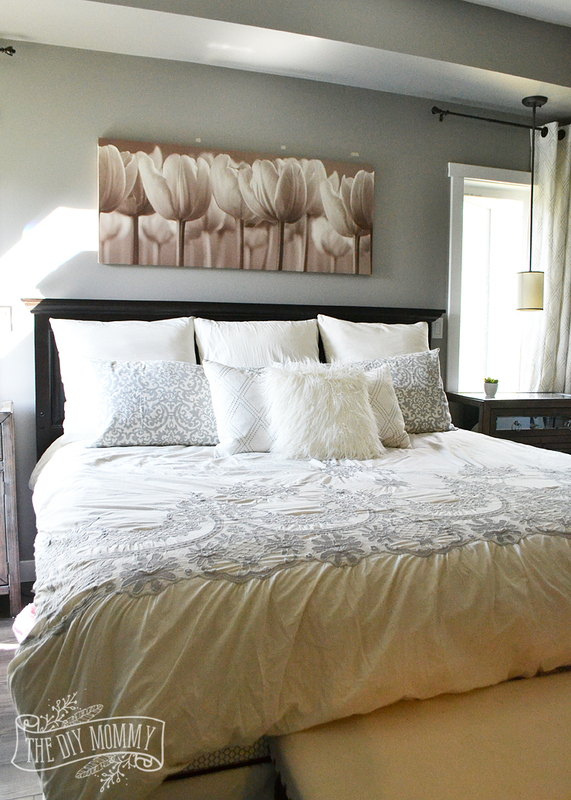 Three cheers for the comfiest mattress and an easy way to make the bed! JUST BEAUTIFUL! What are you using to cover your box springs? Thank you! I have a simple pleated skirt over the box springs. 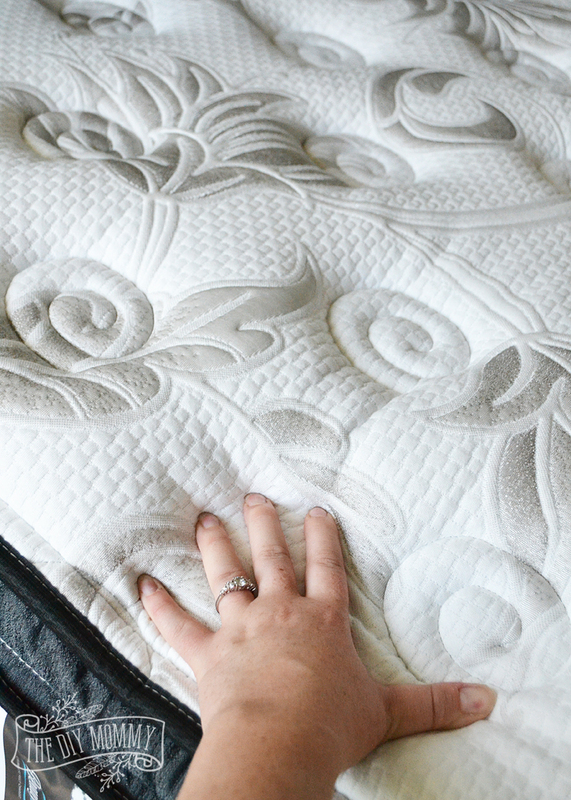 This post has me convinced we too need a new mattress! We’ve only ever had hand-me-down mattresses, which is really kind of sad and the one you have looks superbly comfy. I hear you about the bed-making. I never liked doing it and then the last year or so I started making the effort and it made our room look so nice… but then we had another baby and I decided to let that one fall to the wayside. 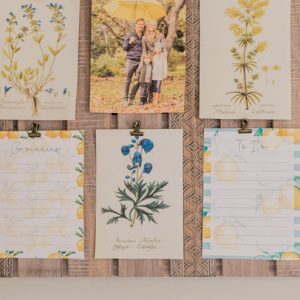 I totally agree that sometimes you have to let things slide – and this is coming from someone who otherwise is a neat freak! Sigh. 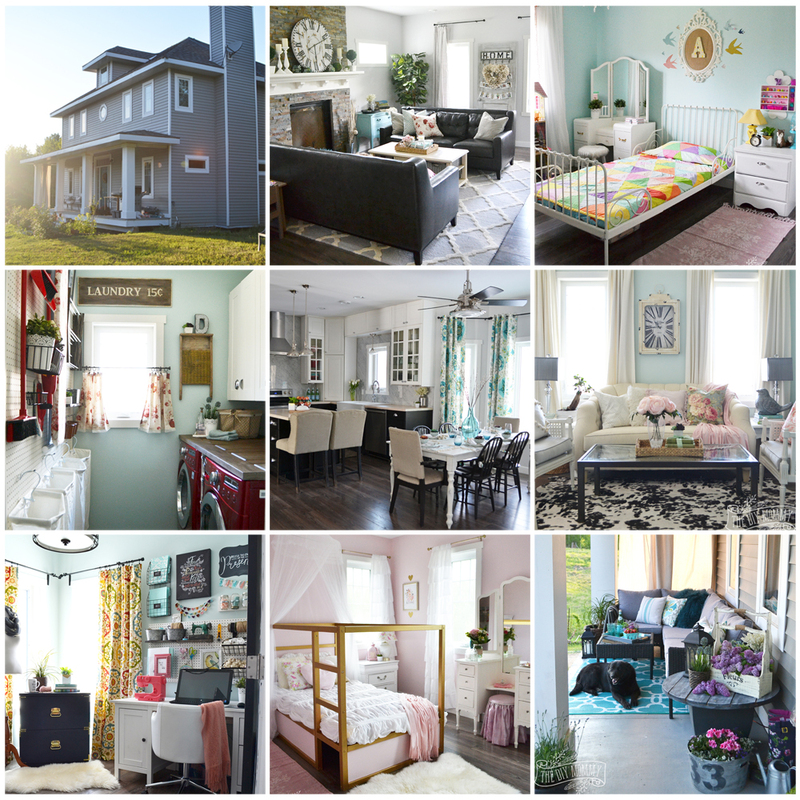 Maybe when my kids are grown up my house can be clean again… Great post! Thanks for reading, Larissa! Yep, I’m SO there. When my kids are older it will be a lot easier to keep the house clean (and they’ll be able to help more with the task, too)! Loved your blog! How is the bed holding up for you? I am considering buying the same one and the reviews that I do find are insane. And yet I fell in love with it at the store. Its so challenging to find a balanced set of reviews as they change the names of the bed at each dealer. I found your blog by searching endlessly for someone to tell me about this bed. ha ha. Hello Carolyn, we would love to give you a review. Are you inquiring about the mattress set or the headboard for yourself? I’m a little ashamed to admit that I very rarely make our bed because really, who has the time when you have 4 kids running around? LOL but it’s great that you shared this! Will definitely try it! Thanks Christina! Awesome story. I really need to invest also in a good mattress. I have my old mattress for almost 12 years now and it is still in a good condition. But I’m still planning to get a new one. Your tips helped me a lot. Thanks! The mattress is just awesome. Looking forward to buying this. Thanks a lot for sharing. Hi Christina, I love your bedroom! The decorative pillow placed in the front center looks great! I am planning to purchase a nice painting like yours for my bed room! I’m concerned with sagging in the center ? As it shown any issues ? My wife and I decided to buy a really good mattress a couple years ago and it was one of the best things we have done. We both had issues with back pain and sciatica nerve pain on our old furniture store brand “memory foam” mattress. The only memory it had was the three best ways to torture us! This mattress sounds almost too good to be true. It’s been 8 years since I purchased my last mattress and I know it’s time for a new one. Thanks for the tip I will definitely be doing more research on the Simmons Beautyrest Hotel Diamond mattress. It is a wonderful mattress, Emma. You won’t be let down! I love your work, You have mentioned the simplest ways to take care on your mattress. Duvet rolling is one of the best ways to cover your mattress, You can maximize your bed’s life by using these simple and effortless ways. Gorgeous mattress! Just loved it. And those pillows on the bed… looks good. The best part was the bed-making tips for lazy people! I’m a very lazy person! The sharing is interesting and useful, I love good sleep, I always choose the best products to support my sleep.